Samson announces the availability of its new series of SXD two-channel power amps, that features three models. Vivid Amps is attending Summer NAMM 2013 where they introduce the new VR2700 two-channel power amp. Lab.Gruppen introduces at Musikmesse its new iPD 2-channel power amplifiers with DSP, which features two models. LD Systems has released a presentation video for its Deep² 2100 power amp. Behringer introduced its Eurocom line at Infocomm 2012 at the Las Vegas Convention Center. Mackie announces the FRS Series of Power Amplifiers at Musikmesse. The new Hoellstern Delta 12.2 and Delta 12.2 DSP 2-channel amplifiers are available now. 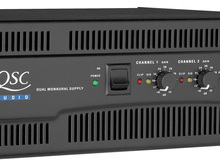 LD Systems introduces the DP 1600 power amplifier (2 x 800W, 2 Ohm).